iRealHousewives | The 411 On American + International Real Housewives: Six Fun Facts About RHOA Newbie Tanya Sam! 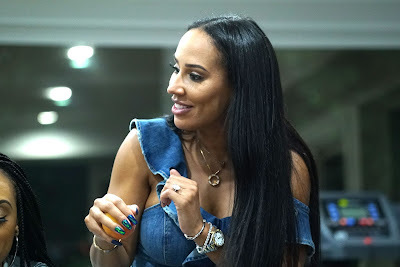 In this week's episode of The Real Housewives of Atlanta, we were introduced to NeNe Leakes' new friend, Tanya Sam during Cynthia Bailey's "Bailey-Cue" event. Sam is the show's official "Friend of the Housewives." NeNe revealed that she met Sam at her store Swaggalicious and became good girlfriends. According to Leakes, although she's an IT "geek," she may be just as big a label queen as Marlo Hampton! Learn six fun facts about the new Georgia peach friend below! 1. She shares a birthday with NeNe Leakes! Both are Sagittarius, born in December 13th. 2. She works in the tech business! Tanya is the director of partnerships at TechSquare Labs, a technology startup hub and venture capital fund. 3. She's a wife! Tanya is married to Paul Judge, is the founding partner of the company where Tanya works. 4. She loves to travel. 5. She loves fashion, such as Fendi, Chanel, etc. 6. She's from up north. She's originally from Toronto, Canada.